A monopoly exists when a specific person or enterprise is the only supplier of a particular commodity. The Monopoly is a market structure characterized by a single seller, selling the unique product with the restriction for a new firm to enter the market. Monopolies are thus characterized by a lack of economic competition to produce the good or service and a lack of viable substitute goods. A monopoly is distinguished from a monopsony, in which there is only one buyer of a product or service; a monopoly may also have monopsony control of a sector of a market. Likewise, a monopoly should be distinguished from a cartel (a form of oligopoly), in which several providers act together to coordinate services, prices or sale of goods. 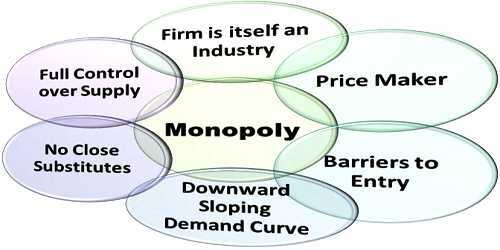 Monopolies, monopolies and oligopolies are all situations such that one or a few of the entities have market power and therefore interact with their customers (monopoly), suppliers (monopsony) and the other companies (oligopoly) in a game theoretic manner – meaning that expectations about their behavior affects other players’ choice of strategy and vice versa. This is to be contrasted with the model of perfect competition in which companies are “price takers” and do not have market power. A LACK OF SUBSTITUTES: One firm producing a good without close substitutes. The product is often unique. Ex: When Apple started producing the iPad, it arguably had a monopoly over the tablet market. BARRIERS TO ENTRY: There are significant barriers to entry set up by the monopolist. If new firms enter the industry, the monopolist will not have complete control of a firm on the supply. This implies that under monopoly there is no differ­ence between a firm and an industry. COMPETITION: There are no close competitors in the market for that product. PRICE MAKER: The monopolist decides the price of the product, since it has the market power. This makes the monopolist a price maker. When not coerced legally to do otherwise, monopolies typically maximize their profit by producing fewer goods and selling them at higher prices than would be the case for perfect competition. Sometimes governments decide legally that a given company is a monopoly that doesn’t serve the best interests of the market and/or consumers. Governments may force such companies to divide into smaller independent corporations as was the case of United States v. AT&T, or alter its behavior as was the case of United States v. Microsoft, to protect consumers. 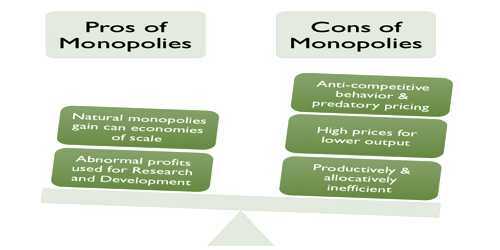 Monopolies can be established by a government, form naturally, or form by mergers. A monopoly is said to be coercive when the monopoly actively prohibits competitors by using practices (such as underselling) which derive from its market or political influence. There is often debate of whether market restrictions are in the best long-term interest of present and future consumers.